Being a Waldorf mom is not easy, but it has given me so many unquantifiable gifts. One of them is the gift of baking and cooking. In our pursuit of healthy fare for our children, we are inevitably driven into the kitchen to make them ourselves. Duh. It seems like such a natural thing, but it wasn’t really for me. I’d always known how to cook, having lived abroad for a time, but healthy cooking and baking was such an alien idea. When they were very little, there were so many more constraints: no egg, dairy or sugar. Now that they are bigger, I’ve become more lax and just try to aim for balance. I so rarely bake with wholewheat flour now because it’s not so easy for us to digest, apparently, so I’m also learning to understand our individual constitutions and go with that. I don’t bake often. What usually brings me there is a constellation of different variables: the weather, time, and a realization that I have milk in the fridge that I don’t want to spoil. I also have a surplus of good organic flour because I had intended to bake for several occasions last month, but was simply robbed of time. I am recovering from a very weird bug and now I have time on my hands. It’s been raining A LOT and that always brings out the nurturer in me. 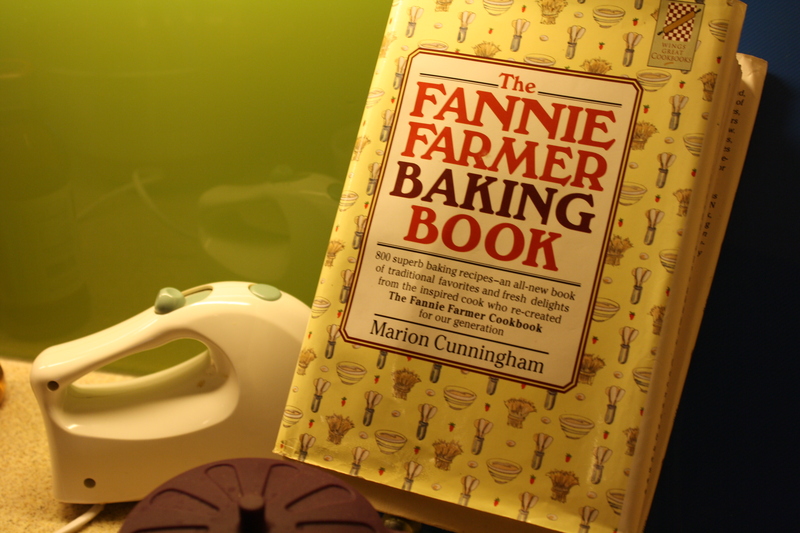 So early this morning, I whipped out my favorite baking book. Since I’m a home baker, I stick to simple recipes that are tried and tested by my sons. I choose the ones that are simple and can be made at a moment’s notice. I’m very organized when I bake. I make sure all ingredients are at room temperature before I start. 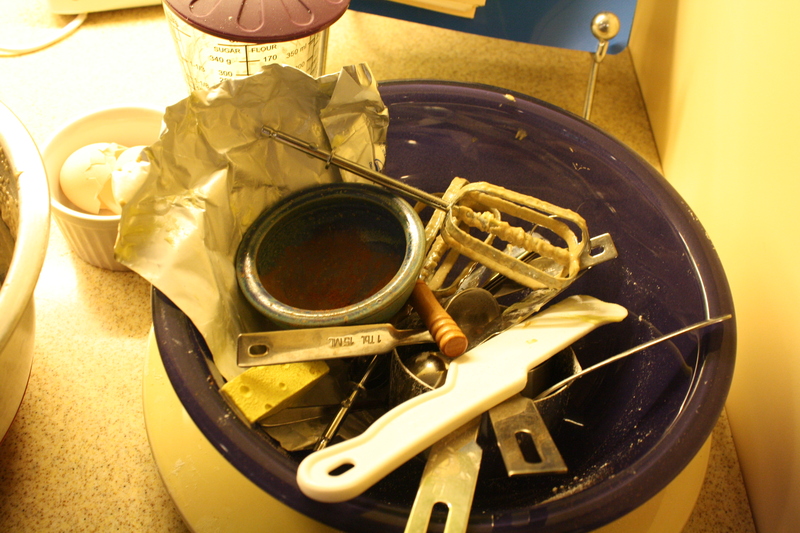 I have a plate on which I put my measuring cups, which catches all the extra flour, sugar, etc., which I then return to their containers. I clean as I go along because I work best that way. My boys were in school as I worked this morning and I’m always happy and sad about that. They make things more chaotic in the kitchen and I’m always having to strike a balance between keeping the work environment joyful, but also making sure they’re not being unmindful of the task at hand. I don’t like food going to waste so I make sure they learn how to measure properly. There’s so much I’ve learned about my boys over the years as we baked or cooked together. 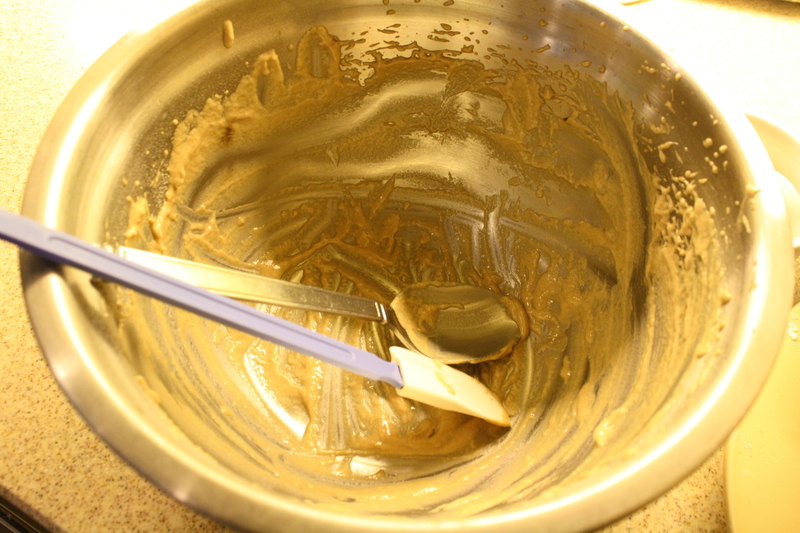 The older one will lick the batter bowl so cleanly that I have to make sure I put it in the kitchen sink before our helpers judge it clean enough to be returned to its place above the oven. He’ll also taste so much as we go along that I worry we won’t actually make the volume the recipe promises. For the younger one, it’s all about donning the apron with the matching baker’s hat I got for them when they were very little, and then looking like a total professional as he goes seriously about the work. He won’t lick the bowl clean and will only succumb to barbaric tasting if he’s pressured into it by his brother. This morning I had none of that. It was just me and my memories. I still make sure I use the “healthiest” ingredients, by the way. 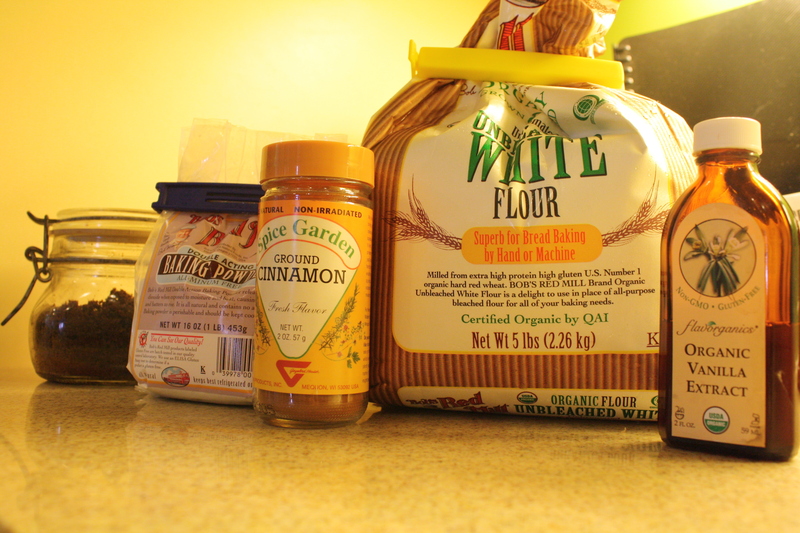 I always buy organic, unbleached, unbromated flour. I never use white sugar; it’s bad enough I use white flour, right? Since coconut sugar has a low glycemic index, I like to use that, but today biodynamic muscovado it was, simply because I didn’t want to have to open a new bag. 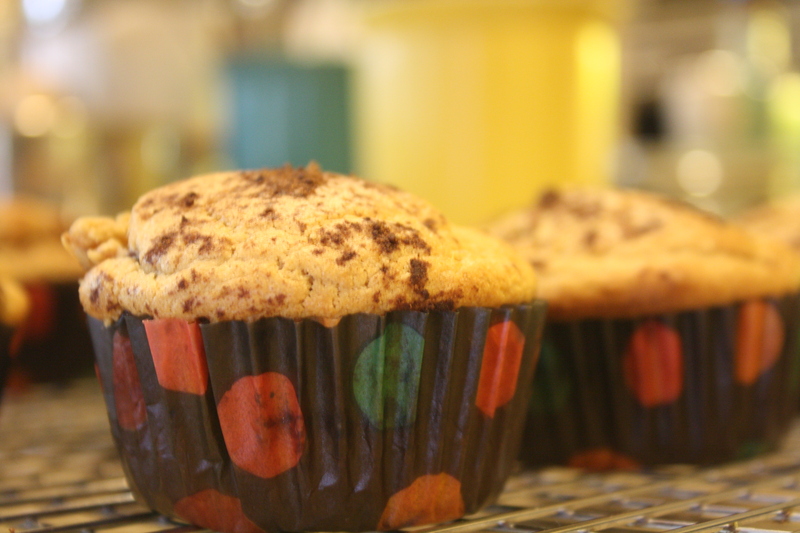 I made basic muffins today with a surprise filling of strawberry jam in the middle and a sprinkle of cinnamon on top. I also love the polka dot paper I found at a small baker’s supplies stall at the Filinvest mall, right outside Power Books. They make me happy! And that was my first labor of love in the kitchen this morning. It’s amazing how one small task can connect you to your family, even as they are away from you for the moment. I thought about my boys a lot as I worked this morning. Cooking and baking memories came together to infuse these treats with more love than any store bought, perfect muffin could ever give. BTW, my daughter is thinking of sending her kid tp Waldorf. Can you give me pros and cons? Oh what a treat! I’ve been looking for coconut flour but can’t find it anywhere (and we have so many coconuts, wonder why no one makes them.) The wholewheat flour’s not good for my tummy either. Will try your unbleached/unbromated one. I just wish I could bake though. My kids need a memory of Mama in the kitchen. Can you send me the easiest recipe? Thanks for the inspiring article Panj. Pau, no coconut flour in healthy o ba? Their gluten free flour isn’t bad. The spelt is also good, but that has gluten as well. Yes to the recipes! Coming up. Your girls will be so impressed ;p.
I would love to cook with coconut flour…my girls loves the coconut flavour….but I can’t find it.